EMERGENCY ACCOMMODATION SHOULD not be a long term solution for Ireland’s homelessness problem, according to the Simon Community. “Emergency accommodation is exactly that – it is only meant to be used in emergency situations. It was never meant to be a long term solution, to place people in not fit for purpose facilities, just to get a roof over their head. We need to move on from that,” said Niamh Randall of the Simon Community. She said that homeless people are getting stuck in the “bottle-neck” that is emergency accommodation. The level of emergency accommodation available depends on what part of the country you live in, said Randall, who said that also goes for what voluntary partnership and statuary services are available. When someone becomes homeless, the first port of call for many is their local authority, who will try and accommodate the persons within their accommodation stock or get in touch with a voluntary group that may be operating in the area. “The local authorities will try and first place them in their existing stock of units and if that is not possible, in emergency hostels, hotels and B&Bs,” said Randall, who said that there are no “official” figures of just how many are in existing accommodation outisde of Dublin. 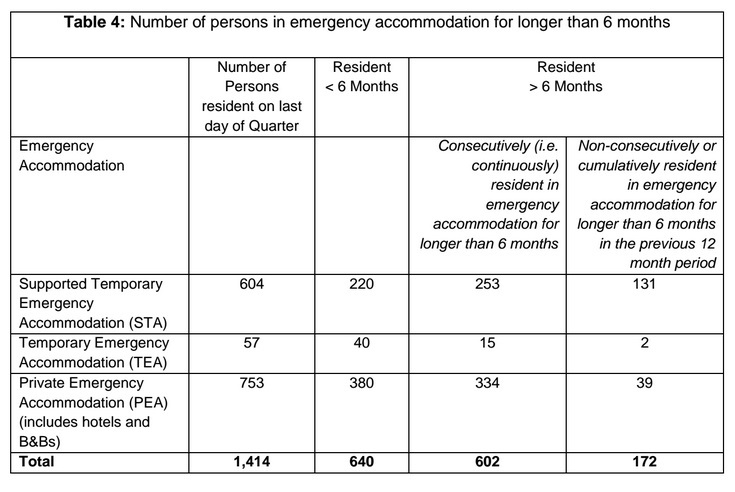 However, people are ending up in emergency accommodation for very long periods of time, which was never the intent. Randall said that living in these conditions has a detrimental impact on people’s mental health and independent living. The Counted In survey, which was published in 2008, by the Homeless Agency in indicated that there was a minimum of 942 households in Dublin in emergency accommodation for longer than 6 months. In the Programme for Government, there is a commitment to eliminate long term homelessness and reduce the length of time people spend homeless. There is a commitment that people who are currently in emergency accommodation for six months or more will be identified locally and arrangements made to facilitate their progression to appropriate long term accommodation. “In future, all homeless services will be focussed on ensuring that no one is homeless for more than six months,” states the Government policy document. Looking at three of Ireland’s largest city councils, Dublin, Cork and Limerick, there is a varying rate of local authority emergency accommodation on the books. Dublin City provide quarterly performance reports to the Department of the Environment, Community and Local to the Protocol Governing Delegation of Section 10 Funding for Homeless Services. For the second quarter of this year, the report states that the total number of beds available at 30 June 2014 was 1,417 across the Dublin region. The total number of beds occupied that night was 1,414. The report states that the demand for emergency accommodation has continued as there was an increase in the number of people presenting to the homeless services in the second quarter of this year. Dublin City Council states in that document that an additional 80 beds will be put in place by September end to meet the demand. Limerick City Council said they currently have 180 emergency homeless beds in the city, with a further capacity to accommodate up to 40 children associated with their funding in Adapt Services (Domestic Violence) and Suaimhneas (Homeless Women with Childen). In June 2014, the former Housing Minister Jan O’Sullivan said that statutory responsibility in relation to the provision of accommodation for homeless people rests with individual housing authorities. She said that their commitment to end homelessness by the end of 2016 is based on a”housing-led approach which is about “accessing permanent housing as the primary response to all forms of homelessness”. The Government’s Homeless Policy states that the availability and supply of secure, affordable and adequate housing is essential in ensuring sustainable tenancies and ending long-term homelessness. In May 2014, the Implementation Plan on the State’s Response to Homelessness in which the Government’s approach to delivery on its objective of ending involuntary long-term homelessness by the end of 2016 was outlined. Randall says she welcomes such commitments but says that stories emerging that homeless people could be housed in prefabs tell a different story. Dublin City Council said that prefabs could be used on vacant sites and that they could be insulated with cooking facilities and separate living and sleeping areas. “We at Simon are really concerned about the use of prefabs,” she said. “This is yet just another temporary solution to a long term problem. Just like every other temporary solution there are promises that it will just be temporary, but that is rarely the case,” she said. Email “'Emergency accommodation is just that - for emergencies, not long term'”. Feedback on “'Emergency accommodation is just that - for emergencies, not long term'”.